File Types: JPG,PSD,All Files; File Size: 280.76 MB; Layered: Yes; DPI: 300 DPI. The Dreamy Waterolour Wedding Invitation Collection includes. Wedding Invitation (12! ), RSVP (4), Information card, Save The Date, Menu, Thank You, Table Number and Placecard templates. Print-ready. All fonts are 100% free. Font download links are in zip folder. 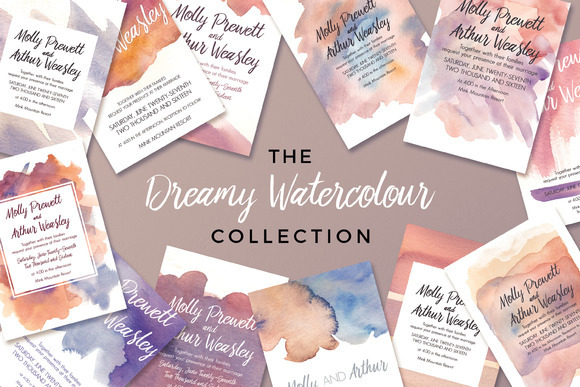 Keywords: watercolor, watercolour, artsy, artistic, painted, wedding, invitation, brushstroke, save the date, menu, pastel, blush, dusty, dreamy, pretty, soft, colorful, colourful, modern, simple, chic, stylish.